"It has brought me happiness to play my forgotten 45s in the same windy city I grew up. Also, It brings a smile to my face when I can help others. I volunteered at the Ronald McDonald Children's Hospital at Loyola. Radio ECHO along with students from Lyons Township High School, provided entertainment and education that became a part of the cure. Donating time and effort was fun at a softball tournament. A chance to see listeners, score against the other radio stations and raise money helping a good cause. AM 1530 is licensed to Elmhurst, IL. Covering the Chicago suburban area, AM 1530 signed on the air October 10, 1974. The station’s original call letters were WKDC representing the signal coverage in Will, Kane, DuPage and Cook counties. The studios were built for stereo (Cetec Sparta equipment) although it was not until 1976 when the FCC authorized the station to test AM stereo. Findings on AM stereo were presented at the 1977 NAB Convention in Washington, DC. In 1995, AM 1530 changed its call sign to WJJG. The call letters stood for owner Joseph J. Gentile. Joe’s nickname is “The Baron of Barrington,” where he owned a Chrysler-Plymouth dealership (many models with AM stereo radios) for many years. In 2012, AM 1530 changed its call sign to WCKG. 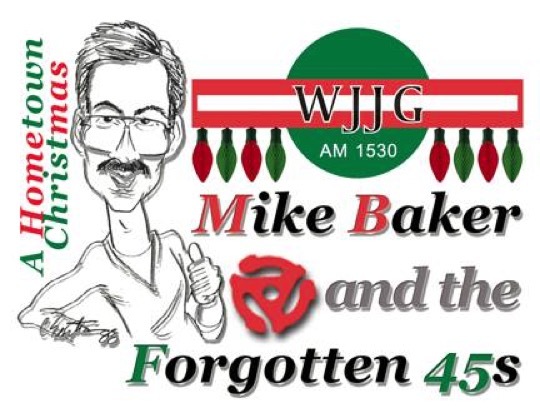 Mike Baker And The Forgotten 45s broadcasted the first "A Hometown Christmas" Christmas Day 1995. Carol and Joe Gentile on WJJG-AM 1530 brought the holiday special to listeners commercial-free. The annual special included Christmas one hit wonders, holiday hits from the golden age of top-40 and more. The broadcast was all live and local, year after year for 16 years. The Sun-Times columnist Jerry Osborne published a list of Christmas one hit wonders of the holiday season. These Christmas hits were the only charted singles for the artist or group. Rudolph The Red-Nosed Reindeer (character and story) was developed by Chicago-based Montgomery Ward 34 year-old copywriter Robert L. May in 1939. It was created as a Christmas story promotion booklet of thier own to save money (in the past, Montgomery Ward stores had been buying and distributing coloring books during the holiday season). Songs of our generation like "The Twist"
Mike Baker likely will be surrounded by the sentimental strains of "I'll Be Home for Christmas" on Monday. But the La Grange resident won't be joining his family until later in the evening. Instead, for the 12th year he'll visit thousands of Chicago area homes as a radio call-in host on WJJG-AM 1530. "My family is used to not seeing me, but hearing me," Baker said. "At the beginning they weren't too keen on me missing out on Christmas or working around my schedule. But they have me on (the radio), and I'm there in spirit." Reflecting the independently-owned Elmhurst station's emphasis on "live and local" broadcasts, Baker will put callers on the air to make musical requests, share holiday greetings and tell what they got for Christmas. The show airs from 7:15 a.m. to 4:15 p.m., and listeners can call (708) 493-1530. "Kids tend to do more participating than adults," he said. "Kids are smart, and some of the funniest stuff comes out." The young callers are rarely tongue-tied on the air with Baker. "If they're shy, I go down to their level," he said. "And there's little tricks. I can plan music in the background, or 'ho, ho, ho' and Christmas sound effects." 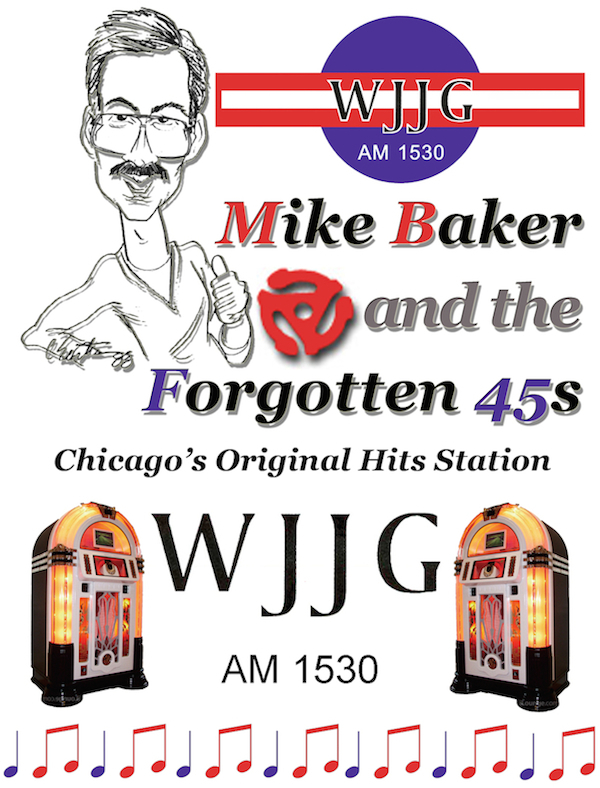 The Christmas call-in gives Baker a little exposure during the hiatus of his mainstay show, "Mike Baker and the Forgotten 45s." The program, which features oldies with a Chicago connection, airs Saturday evenings from March through October, due to available air time and the station's licensing restrictions during daylight hours. While the interruption forces Baker to rebuild his audience each spring, he said a loyal group of listeners is waiting in the wings. "It's like they know I'm in hibernation, and they're just waiting for the spring thaw for me to come back with the music," he said. Baker specializes in spinning tunes of the '50s, '60s and '70s recorded by such Chicago groups as the Buckinghams, the Cryan' Shames or Shadows of Night. Many of his listeners are, like the host, age 45 and older, though some are in their 30s, he said. Station co-owner Carol Gentile said Baker is a valuable asset to the station she and her husband, Joe, purchased in 1995. Baker works Saturdays as a producer and engineer, helping clients who purchase air time to host their own shows. "He helps us with a lot of different things and keeps everything in tip top shape," Carol Gentile said. "He's loved by everyone, like one of the family." The radio personality got his start in the business at Lyons Township High School's radio station WLTL, where he gained production and engineering experience. The 1979 graduate took broadcasting classes at Columbia College in Chicago and liberal arts courses at Northern Illinois University. Baker has worked at radio stations in Joliet and Chicago while also honing computer skills for his day job as a systems analyst at the Chicago Mercantile Exchange. He also has worked as a part-time student supervisor at WLTL since 1993. "I wanted to give back what I got from my education," he said. "I bring my experience from WJJG and other stations and tell the kids what to expect. You can't just be a disc jockey now. You have to know computer software." Baker introduced the use of MegaSeg software at WLTL, after he updated WJJG. The program allows operators to click and drag selections to a playlist, similar to iTunes, so that a request can be played within seconds. "We used to have to cue up a record, or hunt for a tape or CD," he said. "Now I just type the name of the song in the search field." Decades ago, callers' requests were taped days in advance, or on-air assistants coached callers on what to request according to the day's play list, he said. Today's nationally syndicated shows or stations owned by conglomerates continue those practices, he said. And the most requested song on Christmas? "Bing Crosby's 'White Christmas' " Baker said. "I still play it no matter how many times people ask for it." Harry Harrison was born in Chicago.